In the very early days of boats and ships, sails and oars were used to propel them through the water and around our seas and oceans. These methods were replaced when steam engines were first invented. Today however, many ships are powered by fuel that is similar to the fuel we put in our cars. But ships engines use thousands of litres of fuel in an hour, which makes it very expensive to power a ship across the sea. So fuel oils are used that haven’t been through the same cleansing processes as the petrol or diesel in our cars, as this means they will be much cheaper. They are known as heavy fuel oils. It didn’t seem to matter that these heavy fuel oils were dirty and smelly, as ships spend most of their time at sea, and not in port when they were receiving and delivering their cargoes or passengers. So it seemed as if people and the towns and cities in our countries weren’t affected by the heavy fuel oils. But now we know more about the pollutants in the air and emissions that are given out from burning heavy fuel oils in ships engines. These are a major environmental risk to our health, and can contribute to health problems. IMO has been working with the people operating ships worldwide to limit the amount of air pollution ships can emit. Over time, ships will be fitted special systems which can clean the emissions, and also new engines will be installed that emit smaller amounts of chemicals. There are also special ‘emission control areas’ around the world where there are even stricter controls. This includes the Baltic Sea, the North Sea and around North America. These are in areas where there is a great deal of ship traffic or where there is a particular need to protect people on the coasts from harmful emissions from ships. Another problem emission from ships that IMO is helping to control is CO2 – or carbon dioxide. CO2 is also emitted from our cars, lorries, trains, planes and all forms of transport. It is known as a greenhouse gas, which is important for helping to trap the earth’s heat and keeping the planet’s temperature at a constant level. But the balance of gases in the atmosphere needs to be correct and controlling CO2 and other greenhouse gases can help prevent global warming and changes to the climate. But it’s not all bad news on the CO2 front: shipping is the most environmentally-friendly mode of cargo transport per kilometre, compared with the amount of CO2 emitted by lorries, vans, trains and planes in carrying the same amount of cargo. 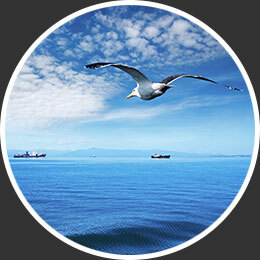 Shipping is responsible for only a small percentage of global greenhouse gas emissions. You could carry out your own investigations to find out more about climate change, air pollution, and how we could all do something every day to and make the air that we breathe safer and healthier for us. Think about what happens to all our rubbish. How many litres of fuel does your family car hold? How can we help to protect the atmosphere?